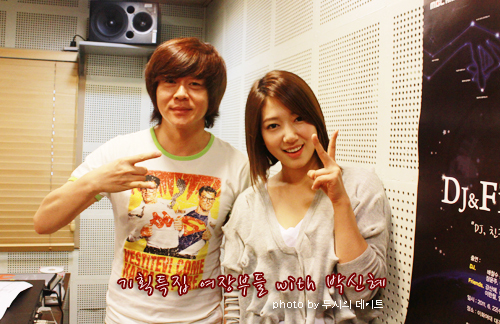 On 27th, Radio MBC broadcast a pre-recorded audio interview segment of 'Heartstrings' cast member Park Shin Hye and DJ Yoon Do-hyun. Y: I heard that Shin Hye has been chosen as the female lead for MBC Wednesday/Thursday drama. Y: The name is 'Heartstrings', cast members include Park Shin Hye who's the guest here right now, CNBlue's Jung Yonghwa, Song Chang-Ui and So Yi-hyun. Except for Park Shin Hye, I am close with all other cast members(jokingly) . Y: What is the drama about? SH: It's a story with an arts university as background. I am a member of the Traditional Music Department while Yonghwa's from the Applied Music Department. A group of friends gathering together for a month to prepare for the school performance. Love and friendship are entwined in the story . Y: There's a lot about music, too, right? SH: That's right. Music takes a major role in the drama. The band that Yonghwa is in )in the drama) is a vastly popular one in school, so there will be a lot of public performance scenes related to that band. Y: Ah that's interesting. The broadcast will begin on 29th? Y: I am looking forward to it. How do you feel? Do you think it will succeed? Y: It seems to be that the atmosphere of the drama is very nice. Firstly, the cast gives people a fresh feeling, and also there's a rock band and a traditional music group. Gives people an interesting feeling. Park Shin Hye's character specializes in gayageum, right? SH: Yes, she is a gayageum specialist. Y: So you gotta practice gayageum? 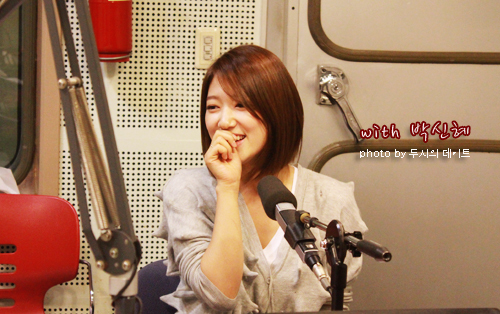 Y: Ah, Park Shin Hye is really talented! 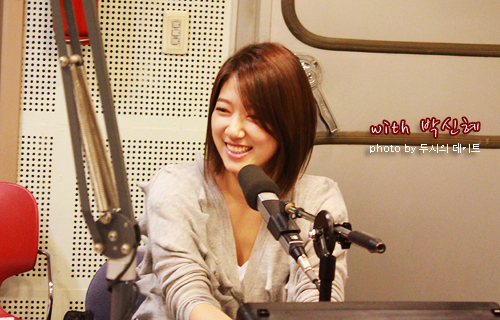 Y: In 'You're Beautiful' (2009), Jung Yonghwa was also cast and starred as a character who loves Park Shin Hye. For 'Heartstrings', is the situation similar? Seems to me that in 'Heartstrings' there will be a subtle loveline between the two of you. SH: Yes there will be. But this time, the situation is opposite... Yonghwa doesn't like me and I fall in love with his character first. My feeling for him in the drama is : 'Ah, this guy is quite nice and quite handsome' and develop feelings for him. Y: This is your 2nd time working together, You two have grown close? Y: Ah, it will be embarrassing, right? I know how you feel, when you're that close friends, you will feel embarrassed when filming these scenes. Y: HAHAHAHAHAHAHAHAAHA!!! Yonghwa is a very cheerful person in real life. SH: Yes, he is very cheerful. Y: That's why he doesn't quite match with his character in the drama (Lee Shin is very cold). Y: If Yonghwa is your boyfriend, how will it be? SH: You mean in real life? Y: Yes, your ages are quite close? SH: Yes, we're same age buddies. Y: Oh you are same age friends! So.. what is your feeling? SH: Hmm... he is very popular in real life, so if we were dating, I would feel very tired.. I would feel like.. he would not be a very good boyfriend... Ah am I too honest? Y: No, I think you're right. When celebrities are too famous, they will give their partners a tired feeling. But if, if Jung Yonghwa is not a popular celebrity, then will it be ok? SH: But.. that is.. AHAHAHAHA!! Y: Jung Yonghwa-ssi, I am sorry (that we are laughing) haha we don't mean it. Yonghwa is a dongsaeng that I like very much. SH: He is handsome, but I think we're better off as friends. Ah.. I am in trouble...? hahahahaha, so cute! I can really feel the sincerity. She's such a wonderful person. I can't wait to see Heartstrings tomorrow. Shin Hye fighting!!!! I love you! is it just me? that Shinhye is getting more lovely each day. Oh my!what does she mean..she's in trouble? Right now, i'm seeing Yonghwa in a different light. shin hye is so funny. "SH: In the drama he is too handsome! Which shocked me and I thought 'Ah this kid has a side like this!" and she's always frank. not beating around the bush. she says it without any grey areas. like "yes" and "no".